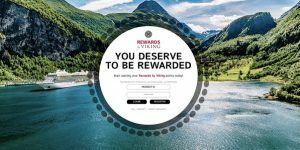 Viking has launched Rewards by Viking – a new loyalty program for travel agents which provides the opportunity to earn reward points for booking Viking’s ocean and river cruises. These points can then be redeemed in the online Rewards by Viking store for a fantastic range of brand-name items — from electronics and sporting goods to beauty products and gift vouchers. “We’re always looking for new ways to reward agents for their hard work and support. Viking is the only cruise line with no Non-Commissionable Fares (NCFs), meaning we pay commission on all aspects of a Viking cruise booking. This, in addition to our new rewards program, demonstrates just how much Viking values its dedicated trade partners,” said Erin Kramer, Trade Marketing Manager at Viking. Travel agents wishing to join Rewards by Viking can register at www.rewardsbyviking.com. As a special bonus, Viking is giving $25 worth of reward points to agents who register before 31 December 2018. In addition, Viking is getting into the festive spirit by running a 12 Days of Christmas promotion starting on Monday (3 December). Each weekday will feature a different promotional offer which, if booked on that day, will result in additional $50-$100 worth of reward points.